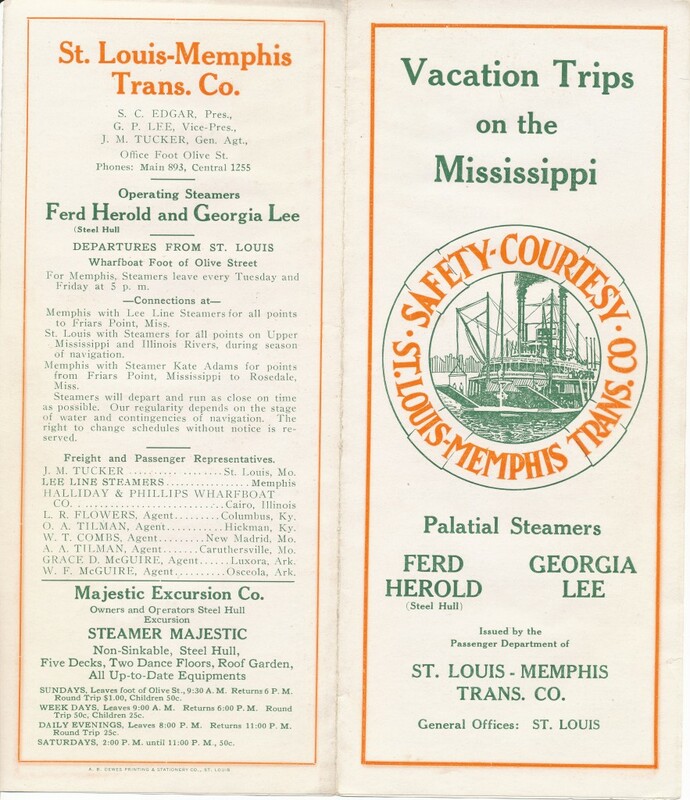 This advertising flyer must have been printed sometime between 1915 when Peters Lee converted the Rees Lee to the Majestic and 1918 when the Georgia Lee was crush by ice December 1918. The Lee Line sold the the Georgia Lee, Ferd Harold and Rees Lee in late 1914 to the St. Louis-Memphis Transportation Co. The Rees Lee (formerly the S S Brown)was renamed the Majestic (see picture under Univ. of Wisconsin tab). A 1914 board of directors meeting minutes noted that the Rees Lee had been laid up idel during 1914 due to poor business conditions. My great Uncle G Peters Lee and my grandfather S Rees Lee Sr. purchased these boats along with several outside investors and formed the two companies advertised on the brochure. My Great Uncle G Peters Lee owned the Majestic Hotel as well as adjacent the Majestic Bar Pool Hall around 1912. My friend Ed Provine graciously allowed me to copy this brochure.